History, Description, Hiberno-Norse Ecclesiastical Metalwork. in the Hiberno-Norse, La Tene Style. 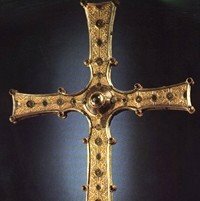 The Cross of Cong, now a prominent exhibit in the Hiberno-Norse/Romanesque collection, preserved in the National Museum of Ireland, is one of the finest exemplars of Celtic metalwork. It is a lavishly decorated processional cross, and was made in Tuam or Roscommon around 1125 CE, in order to enshrine a relic of the True Cross that had been acquired in 1122 by Turlough O'Connor, High King of Ireland. While to some extent it can be regarded as the last and finest artifact of Early Christian art - the culmination of a tradition of processional crosses beginning with the 8th century Tully Lough Cross - it also exemplifies three influential elements of the period 850-1150: Scandinavian culture, Celtic metalwork, and Irish monastic traditions. The Cross of Cong was made for the Cathedral church of Tuam, County Galway, but was later moved to Cong Abbey in County Mayo. Its function was to hold a fragment of the original cross on which Christ was crucified, a role which must have added to its devotional value and no doubt accounts for its elaborate construction. See also: History of Irish Art. The Cross of Cong measures 30 inches in height, 19 inches in width, and is roughly a quarter inch thick. It is made of solid oak, encased in plates of bronze and silver, and washed in some places with a layer of gold. Fillings of niello (a compound of sulphur with silver, lead or copper) are also visible, while around its centre-front it has areas of finely wrought gold filigree. All the plates are elaborately decorated with interwoven patterns, called "strapwork", common to numerous types of traditional Celtic art (dating as far back as the La Tene and Hallstatt cultures) - including metalwork, illuminated manuscripts and high cross sculpture - while their outer corners show traces of original studwork of precious stones and multi-coloured glass enamel. In the centre of the cross is a large polished crystal, under which was placed the relic of the True Cross (since lost), part of which would have been visible to the viewer through the semi-transparent crystal glass. Representations of fantastic animals also occur, including one towards the foot of the shaft - underneath the head of which sits the ornate sphere containing the socket for the processional pole. A good deal of this designwork - notably the S-shaped, ribbon-like animals intertwined with threadlike snakes - derives from traditional Viking culture such as the Ringerike and Urnes styles of art - styles eagerly adapted by native Irish craftsmen who made them their own. They can also be seen on the Shrine of St Patrick's Bell, the late High Crosses at Kilfenora and Dysert O'Dea in County Clare, and the Sarcophagus at Cormac's Chapel, at Cashel, in County Tipperary. What Inscriptions Appear on the Cross of Cong? Around the sides of the cross a series of Latin and Irish inscriptions are punched into the silver plate, by dies or types, commemorating the names of those in any way connected with its creation. Also, on both sides of the lower portion of the cross is an engraved inscription which says: "In this cross is covered the cross on which the Founder of the world suffered." What are the Origins and History of the Cross of Cong? During the 9th and 10th centuries the monastic character of the Church intensified, along with its missionary endeavour, but the secular backdrop was changing. Although the country still boasted a multiplicity of small kingdoms, constant struggles against the Vikings, along with improvements in weaponry, triggered the emergence of a few powerful dynasties who took control of larger areas of land. The Viking Age (c.850-1150) witnessed a further consolidation into one or two main dynasties for each province, before the system eventually threw up a single leader for the entire countryn during the reign of Brian Boru. On foot of the Battle of Clontarf (1014), the main regional dynasties produced alternating Kings who acted as overlords for most of the 11th century before power finally fell to Brian's successors, the Ui Bhriain, at the end of the 11th century, and after them, the O'Connors. The greatest of the O'Connors was Turlough, and it was he who in about 1125 ordered the creation of the Cross of Cong to enshrine a relic of the True Cross that had been sent from Rome in 1123. It terms of the development of Irish monastic art as well as Celtic culture, the Cross of Cong represents the apogee of late medieval Christian art, including items like: crosses, croziers, tomb-shaped shrines, reliquaries, as well as shrines made to encase revered bells, books and other sacred relics. In the annals of Ireland, it is sometimes referred to as "an Bacall Buidhe", meaning "the yellow staff", because of its golden colour. After completion, in about 1125, the cross was presented to the king before being placed in the Church of Tuam, during the Archbishopric of Muiredach O'Duffy (d.1150). It was then transferred to the Augustinian Abbey of Cong - possibly by O'Duffy, who died there, or by King Turlough O'Connor, who had previously founded the abbey. Whether or not it remained at the Abbey for the following 650 years is not known, but at any rate it was seen at Cong in 1822 by the Cork antiquarian George Petrie (discoverer of the Petrie Crown) who informed Professor James MacCullagh (of Trinity College, Dublin), about the cross and of its historical value. MacCullagh afterwards purchased the cross from the Parish Priest of Cong (Fr. Michael Waldron) and in 1839 presented it to the Royal Irish Academy. In about 1890, the cross was moved to the newly opened National Museum of Science and Art in Dublin - the predecessor of the National Museum of Ireland (NMI). Since 1925, the Cross of Cong has been under the control of the NMI. Regarded as one of the last pieces of ecclesiastical jewellery art of the Middle Ages, it is considered to be one of greatest examples of decorative religious art of its age in Western Europe.  For information about art and crafts in Ireland, see: Irish Art Guide.  For our main arts index, see: Homepage.